Please review your basket items - click "Home" to return to the Home Page. When you are ready to purchase, simply click "Make Payment" to transfer to PayPal, our Secure Payment Partner. All online transactions will be carried out by PayPal - a world leader in secure payments. 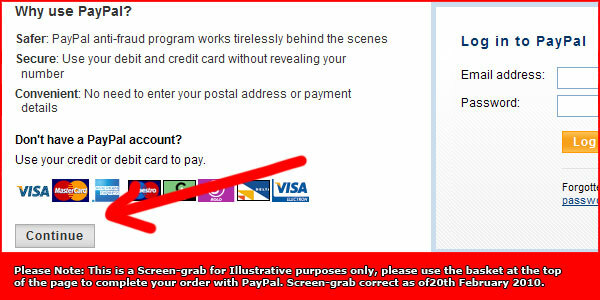 You DO NOT need an account with PayPal in order to complete your transaction, if you do not have an account, look out for the "Continue" button, highlighted in the illustration below, to complete your order by Credit or Debit Card. converted to the currency of your choice at the PayPal Checkout. We aim to turn orders around within 7 days and 1 to 3 days in the run up to Christmas. UK orders will ship by Royal Mail - 1st Class. All overseas orders will ship by Royal Mail - Air Mail Small Packet Rate. Air Mail UK to Europe takes approx 4 to 7 days. Air Mail UK to USA takes approx 7 to 10 days. Air Mail UK to Rest Of World takes approx 8 to 14 days.